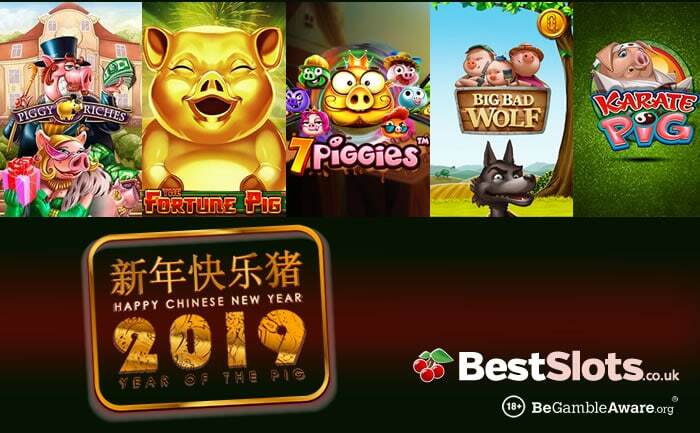 This month heralds the start of the Chinese Year of the Pig which gives us a great opportunity to pick out our favourite porky-themed slot games. First on our list of porcine favourites is the oldie but goodie Piggy Riches. This 5 reel, 15 payline slot game from Net Entertainment has a luxury theme. Picture the rich and famous in a parallel universe dominated by piggies. There are plenty of goodies on offer at this porky palace though including a wild that trebles payouts and a bonus round where you can win up to 28 free spins with multipliers that can send payouts rocketing by up to 6x. Next on our list of pig-themed favourites is the recently released The Fortune Pig. Another fine-looking slot game from the iSoftBet design team, it also comes with pretty tasty extras. Look out for stacked wilds as well as streak re-spins where each symbol that hits awards a cash prize and a free spins feature complete with synced reels. There’s plenty to like in this very playable new arrival. Pragmatic Play takes people down to the farm in 7 Piggies. It’s a simple but potentially quite volatile slot game that’s played using a 5 reel, 7 payline game engine. There’s only 1 feature round on offer here but it’s a good one. You’ll start with 5 free spins at 1x. Click on the barns to add more free spins and multipliers into play. With its cartoon visuals and twangy country soundtrack, 7 Piggies has a decidedly silly feel. Get lucky with those multipliers and these little piggies can deliver some pretty serious action. Madcap martial arts-themed action is what you’ll find in Karate Pig, a 5 reel, 40 payline slot game from Microgaming. There’s a good selection of extras on offer here, starting with the bonus round that awards 15 free spins with all payouts doubled. There are also 2 pick me features. Trigger them multiple times to earn belts. Gain your black belt and you’ll be able to take on a mystery opponent in the Final Showdown Bonus feature and win even more prizes. Karate Pig is very silly but it can certainly pack a big payout punch. Our final pick is Big Bad Wolf, Quickspin’s take on the classic tale of the 3 Little Pigs. It’s a 5 reel, 25 payline slot game that’s played using Swooping Reels. They’ve packed in some pretty good features here too. The Pigs Gone Wild bonus adds extra piggy wild symbols to the reels. Keep a special eye out for the Big Bad Wolf who triggers the free spins round and award 10 free spins. All these porky themed slot games are available to play at LeoVegas Casino – with more than 1,100 slot games to choose from, they welcome you with 20 no deposit free spins on Play ‘N Go’s Book of Dead. On each of your first 4 deposits, you will get a 100% match bonus up to £100 plus 20 more bonus spins – that’s a total of £400 in bonuses and 100 bonus spins up for grabs.